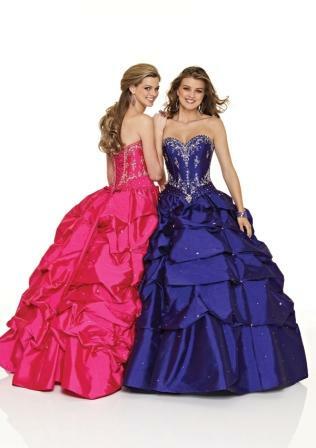 Ladies and Teens formal wear. Sweetheart ball gown with pickups, Women's Halter ball gown, Figure flattering modified mermaid Gown, Mermaid sweetheart gown, Ladies and teens ball gown with pickups. Our gowns are not brand name designer dresses. We custom manufacture design inspired gowns which closely resemble the photographs but include signature design elements unique to us. The images shown are reference photographs to illustrate the basic design and cut of the gown. We only use high quality fabrics and all our embroidery and beading is hand done. Each gown is uniquely made for every client and no two are exactly alike. Each dress is similar but not exact to the original. If you want a custom designed dress personally tailored for you, anything added or changed on any dress, contact us prior to ordering. Modifying dress styles is one of our common practices. 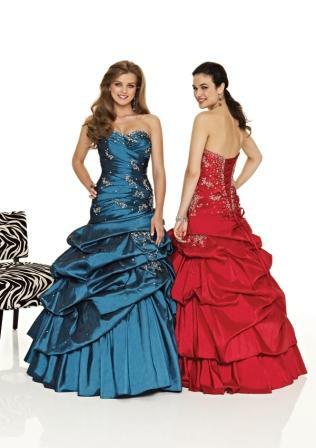 All of our gowns on this page are available in, Satin 70 color choices, Chiffon 110 color choices, Taffeta 110 color choices. Shown in Red and Turquoise. Shown in Jade, Fuchsia, and Midnight. Available in 110 colors. This gorgeous Ball Gown features a sweetheart neckline, hand bead work on fitted bodice, full skirt with multiple tucked detailing. Lovely Gown also features a lace up back making for a fabulous fit! 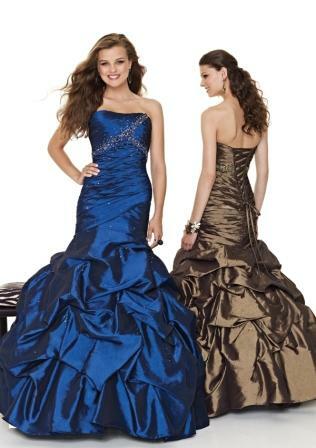 Strapless dress has a glittering inset at the center of the bust. Jeweled applique moves through the top of the bust, empire and true waists for a stunning look of glamour. The corset-style whittles your middle with jewels scattered about and a lace-up ribbon detail at back. A full tulle skirt glitters, making you the belle of the ball. This gorgeous Mermaid Gown features an embellished sweetheart neckline, fitted torso, and full lower skirt with asymmetrical overlay. Standard Prom Gown Delivery: 8 Weeks.